Firefighters shot water on smoldering embers yesterday as they mopped up after a brush fire near Farrington Highway between the Waianae Boat Harbor and Waianae High School. Several homeless people were evacuated yesterday after a wildfire burned their encampments in an undeveloped shoreline area on the Waianae Coast. The brushfire happened near Waianae Boat Harbor and left many homeless people scrambling for safety. Firefighters said the cause of the 12-acre fire was undetermined, but one homeless woman said she believed it was started by students from Waianae High School. The blaze erupted about 11:40 a.m. along the shoreline in a brush-filled area between Waianae Small Boat Harbor and Waianae High School. Honolulu fire Capt. Terry Seelig said 45 firefighters in 11 companies fought the fire with water tankers because the fire hydrants were not nearby and brought the fire under control about 12:45 p.m. 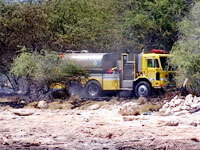 Firefighters worked several more hours to extinguish hot spots in the deep-seated fire. No one was injured, and no structures were damaged. 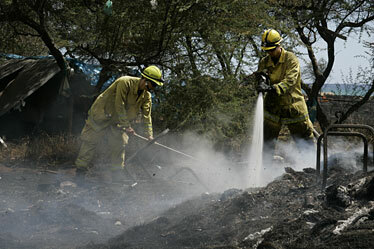 About five homeless people who live in tents on the state-owned, 19.5-acre property were evacuated by firefighters. Brenda Cruz, 45, who lived there for about two years, said she was dozing in her tent near the high school just before the fire. High school students often cross through the area on their way home, according to community members. Firefighters sprayed water on smoldering embers as they mopped up a brush fire that burned to the edge of this homeless camp. The brush fire left a blackened, charred mess on the makai side of Farrington Highway between the Waianae Small Boat Harbor and Waianae High School . Cruz said she heard some boys talking and one of them say, "Run! Run! The fire started!" She said she exited her tent, felt the heat of the fire about 10 feet away and saw four boys in their mid-teens in flight. She said she yelled out and chased them about a mile through the boat harbor and up on Farrington Highway, losing them in the direction of Nanakuli. When she returned, firefighters wouldn't let her onto the property, and a police officer told her that her belongings were destroyed. Lost in the fire was a $200 propane stove that Cruz bought recently, three tents that she and her son used, and food purchased with food stamps, all totaling about $2,000. "I have nothing so I hope that people can help me with stuff," she said. 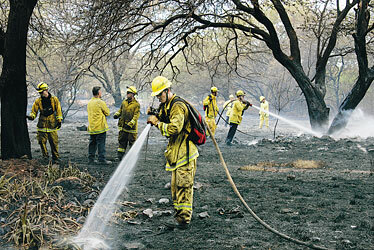 The wildfire burned mostly brush and kiawe trees, but several tents remained standing amid black ash. Tiger Breaux, who recently moved into public housing with his fiancee, said he saw the fire while returning to his two tents for his dogs. Quick-thinking neighbors rescued his dog Coco, a dachshund mix, and its four puppies, but Breaux's pit bull ran back into the tent, and he ran toward the fire to rescue the dog. Maria Lutz, director of disaster services for the Hawaii Chapter of the American Red Cross, said responders found only one woman who lived in the area that was affected by the fire and provided her with clothing, food, and shelter. "My main concern was always fire," said Cruz, who lost her three tents. "I knew one day it was going to happen."